This weekend is kicking off to a solid start if you’re in the market to coordinate your makeup with your loungewear. How so, you may ask?! 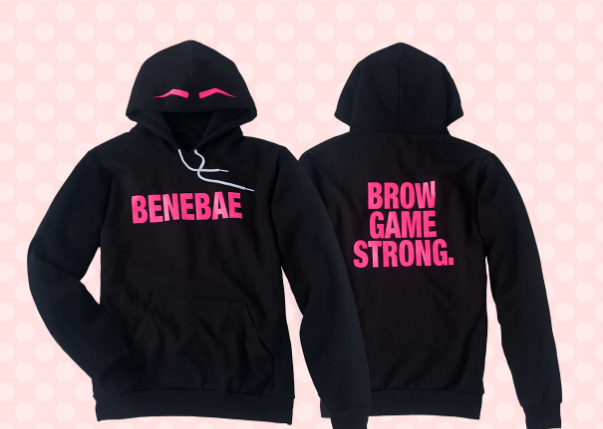 Well, while supplies last the Benefit Cosmetics hoodie is available for purchase for your snuggling pleasure! We have a feeling you’ll want to act fast because whenever Benefit Cosmetics comes out with something coveted, the shopping vultures swoop in. In addition to the recently restocked Benefit Cosmetics hoodie that we want to rub our faces in, there’s also an exclusive pink rhinestone hand mirror that’s making the rounds. Unsurprisingly, the sweatshirt and the hand mirror match. The people at Benefit know exactly what they’re doing to us when they coordinate new products. We’re not mad, though. You can buy the hoodie through the Benefit Cosmetics website for $58! The mirror looks like it came straight out of a fairytale. You can buy the hand mirror through the Benefit Cosmetics website for $24! For those new to these restocked hoodies, the back of the sweatshirt is doing the most work of all. If you’re looking for a new number to sprawl in while recovering from the work week, act fast, because if you don’t we will!